MiraGuard Technology: Triple-walled vacuum insulation keeps foods hot for up to 5 hours, or cold for up to 10 hours. Bring hot foods like soup, pasta, or rice to work or school without needing to use a microwave! Perfectly Portable: With a 25 oz (750ml) capacity, this food jar is big enough to fit an entire meal yet small enough to fit nicely in kids lunch boxes or adult lunch bags. Confidently pack this sweat-proof, leak-proof food jar in a bag or backpack. Built to Last: This premium food jar is made of high-grade 18/8 stainless steel that won’t rust, break, retain or transfer flavors. Our unique powder coat finish provides extra durability and a slip-free grip. Reusable: With your health in mind, this eco-friendly food jar is made without BPA, phthalates, lead and PVC. This reusable jar is perfect for packing countless meal preps, breakfasts, lunches, dinners, and snacks. Functional Style: Our stylish food jar comes in multiple colors and has a smooth, matte finish. Designed with an easy twist off cap, jars are easy to clean. With an insulated food jar, you can skip on eating outside food and pack a healthy, homemade meal instead. Simply place your heated tasty food in the jar and enjoy it hours later on! Wide spout, good quality I got this to use for pour over coffee since my carafe broke. I was using thermos initially, but the spout is small. The opening to this jar is really large. The only larger spout larger is a product that is very expensive. So if I get another, it will be this one again. Kept my food hot! Wanted a 24oz thermos to hold enough liquid and big enough that I could also eat out of too. I took it tailgating and while everyone else ate sandwiches I had hot soup. 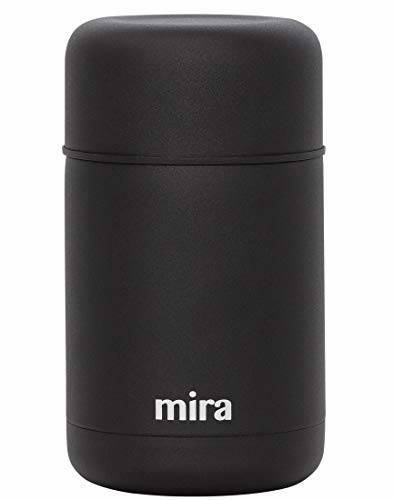 It even held the heat being left in the cold car up until after the game.I recommend it if your looking for a decent size thermos without spending a lot of money on it.